I did it. With just $35* to spend, I was able to eat (mostly) wholesome food for a week. There were times, especially in the beginning, when it was challenging–but there wasn’t a point when I felt like I had to throw in the towel and grab can of chicken. So challenge completed. But is it sustainable? A recap for those who haven’t been following along so far: Sherrie Flick,Cory Van Horn, and I decided to see if we each last a week on a $35 food budget. This is a pretty significant challenge in itself–I could easily spend $35 a day on food. Eating Good Food was the other part of the challenge; we could probably make this happen by eating processed junk and Dollar Menu offerings, but could we do it if we limited ourselves to whole foods? I realized before the project started that I wouldn’t be able to do it alone, so I planned a series of tasks that would combine community connections with my culinary skills, this would earn me a “free” meal. It worked out more or less as planned, and, no surprise, I also learned a thing or two along the way. People were terrifically generous. While working at GoodTaste! Pittsburgh, a friend gave me a jar of homemade maple apple butter. At a potluck the next night, the hosts tried to give me…all the leftovers. My ladyfriend brought a ham for me to cook (see earlier entry for a breakdown on the Great Ham Controversy). Other tried to give me random bits of this and that, and several suggested they just leave food for me somewhere so that I could “discover” it. I drew a pretty firm line in the sand and stuck with it–I wasn’t looking for handouts, that would have been too easy. The apple butter was accepted because this friend would undoubtably give apple butter to someone who needed it (who am I kidding, she would fill your freezer with home-cooked meals if you needed it). 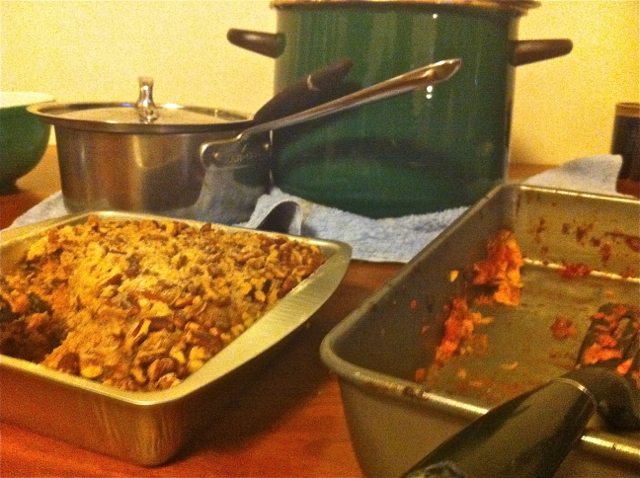 I took some food home from the potluck, but nothing more than a guest would normally take. As much as I wanted to chow down on ham for the rest of the week, just about all of it went into the freezer (some of it might come out of the freezer today). And no meals were “discovered.” If I were truly in this situation, I would have leaned on my friends more. 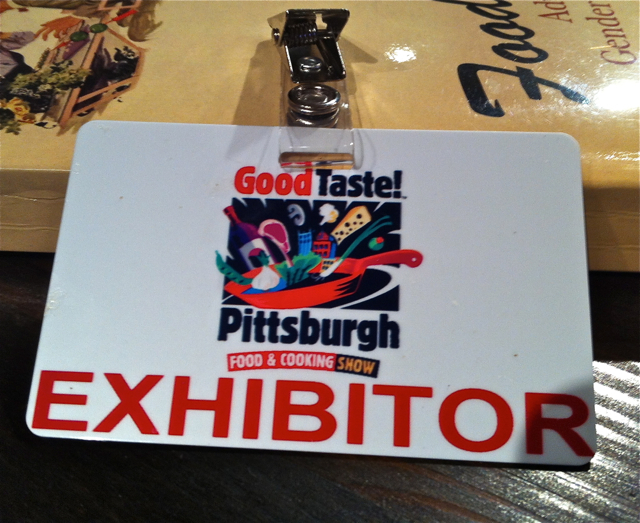 I’m really luck to have connected with a community in Pittsburgh that values the importance of a good meal, and is always willing to share. Apparently, I’ve also fallen in line with a bunch of rule breakers insist I take their food for free. What a bunch of rebels. Volunteering was a big part of the project–you can read more about my experiences in the day-by-day recaps. Connecting with people who don’t have a choice about the food they eat totally put things in perspective; I was complaining about being hungry, and then I met people who are actually hungry. This turned the project into something much more personal. I took on the idea on on lark, as an experiment. The same day I volunteered at the soup kitchen, I dropped a huge pot of beans on the ground. Normally, I’d be pissed off that I had so much cleaning up to do (I’m clumsy, I drop things). When it happened this time, I was devastated that I was losing so much food, and so much good food too. The food was irreplaceable–I’d used precious bits of ham and onion to flavor the beans, there were none left for the next batch. The fact that I seriously considered keeping beans that had fallen on my not-so-clean kitchen floor was really telling. I cooked. A lot. I cook a lot in general, but this was extreme. 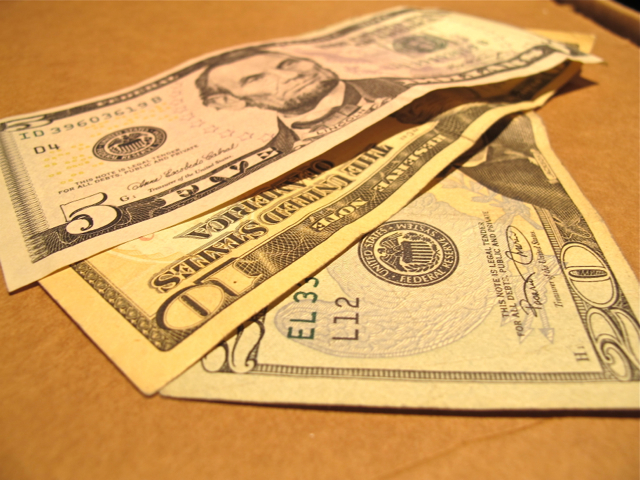 There is no possibility of dining out (at least dining out on wholesome food) on a $35 per week budget. Everything has to be made from scratch. All in all, I enjoyed my time in the kitchen–I mean, cooking is such a big part about what I do, so why wouldn’t I? But I did notice my creativity started to wane toward the end of the week. At first, I was trying to use this as opportunity to be as creative as possible, but by the end of the week I just wanted to get fed. Perhaps this was a because I realized that the project was taking up more and more of my time. I wanted to be true to the nature of the experiment, but I also didn’t want to miss a deadline/fail any of my classes. So instead of diligently planning out meals that combined flavor/nutrients/sunshine, I made a variety of soup. 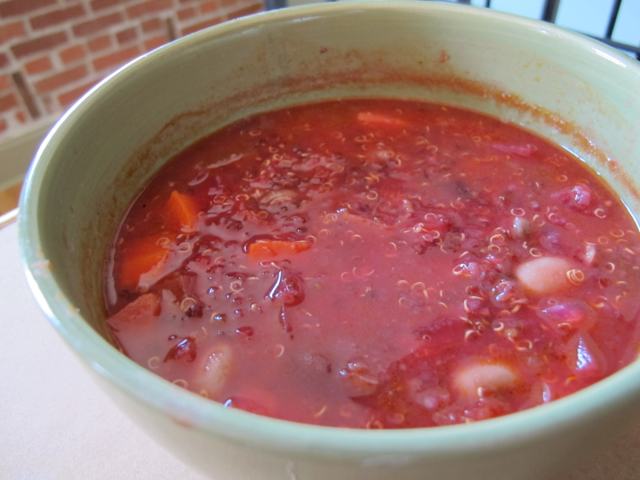 Good soup, delicious soup, soup from scratch–but still soup. To my surprise, snack time turned out to be a much bigger challenge than mealtime. I didn’t realize how mindlessly I snacked until I had to be mindful of everything I ate. Suddenly an apple or a banana was a precious commodity. It was a difficult adjustment during the first few days. I would casually wander over to the kitchen, and then realize that I couldn’t actually eat anything. At first this made me feel more hungry than I really was, but eventually I learned to ignore it (OK, perhaps I learned to live with it–I still wanted to snack). There are plenty of reasons to critique this project. The first is that I (and my partners in writing) are part of a leisure/creative/academic class, and therefore have the opportunity to explore this. Agreed. We are. And frankly I’m glad we are. The creative part of society has been constantly demonized, and I think that’s a bunch of crap. My response to this is perhaps one of the biggest problems in our food system isn’t the food system itself (is a MASSIVE problem, don’t get me wrong), it’s that as a country we’re on a downward spiral to catch up with the lowest common denominator. The fact that so many people don’t have time to cook isn’t just a reflection on privilege, it’s a kick in society’s face. We should all have time to cook (or pursue a hobby, play a sport, read a book, etc), we shouldn’t have to run to McDingDong’s because we’re so worked to the bone that all we want to do is get home and watch other people cook on TV. It’s sad. It also called into question my belief that people should pay more for their food. I have the luxury of being able to purchase humanely raised meat; that’s expensive. I’ve often said that it should be expensive because farmers and farm workers should be able to earn a decent living without being forced to treat animals like commodities. But if it remains expensive, how can a person with only $35 for the week eat humanly raised meat then? Some would argue that we shouldn’t be eating meat at all. Fair enough, but I disagree. We should be eating less meat (and avoiding factory meat), but I don’t believe we should be eating no meat. That’s a totally different subject for a post, isn’t it? The point is that this week forced me to question where the balance is between supporting farmers and farm workers, and being able to afford Good Food. Perhaps we need to be spending less money on other things? Growing gardens? Working communally? Another critique: This is a bit of a whimsical exercise, and we weren’t really in the same position as people on fixed incomes. Agreed, and at times it made me feel terribly silly about doing this project. Who am I to think that my participation in this is somehow important? This was an exercise, and it’s not going to change the world. But like we said at the beginning, it wasn’t designed to be perfect. It was, however, a terrific learning experience. I am still thinking about every food choice I make. I’m going to go back to the soup kitchen next week. It’s challenged me to rethink ideas and ideals. So perfect? Not at all. Worthwhile? I’d say so. Some people felt my methodology of using my culinary skills and community connections to “earn” meals was a cop-out. I disagree. While I don’t think bartering my time would be practical over the long term, I do think it was worthwhile. I was able to connect with people who needed help in some way, and I think that’s a pretty good thing indeed. So is a $35 weekly food budget sustainable? No, not for me. It can be done, and of course there are people who don’t have a choice. Perhaps during the summer it would have been an easier project since my garden would be in full swing–that wasn’t an option right now (though I will be sure to grow & save more next year). In some ways, I actually ate better throughout the week; more vegetables and whole grains than I normally would, I cut down on my meat consumption (and only purchased meat raised in a way I philosophically agree with), and reduced my overall calorie intakte (sad Hal, no snacks). But in the end, I love food way too much to have to decide between a piece of cheese and a slice of beef. I’m grateful that I don’t have to make that choice right now. I’m also mindful that we as a society need to work to build a food system that ensures everybody has access to wholesome meals. *Technically I had $45 to spend. When we set the ground rules, we decided coupons were allowed. I cashed in a Living Social Deal that allowed me to spend $20 at Whole Foods for only $10. As the week went on, I started to feel like I was gaming the system; Whole Foods doesn’t have coupons like this on a regular basis. So I decided to try to stick as close to the original $35 as possible. I came close, and probably would have done it if I didn’t make a few choices (I’m looking at you, cheese) on my original Whole Foods trip. Both of them are fantastic writers, and I found their collaboration on the project as worthwhile as the project itself. Food, Community, and $35 For the Week: Days Four and Five, Helping. Day Six, Rain Out. My earlier complaints about hunger seem very silly now. 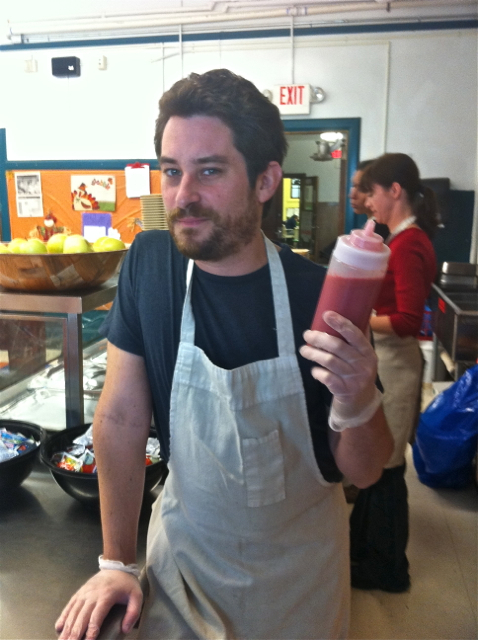 On Day Four, I volunteered at the Jubilee Soup Kitchen. This is the experience that will resonate the most with me from this project. During my graduate studies, I’ve taken classes on food access and talked at length about privilege, status, elitism, and all that good stuff. All of this was educational, but none of it impressed me as much as seeing people waiting outside the soup kitchen for a free meal. The biggest rush happened right at the start, but there was also a steady stream of people for the entire two hour lunch service. What stuck me most was the atmosphere of the soup kitchen–it wasn’t an unhappy place. Perhaps it had something to do with the unseasonably beautiful November day, but I don’t think so. There was a sense of community there. I’m not trying to paint a picture of unicorns and moonbeams–it was still a soup kitchen, and there were certainly a significant amount of people who seemed to be in a very challenging place in their lives. But it also wasn’t as bleak as I’d thought it was going to be, and it seemed like most of the people there were just in need of a little bit of help and kindness to get them through the day. Don’t get me started on the whole “pull yourself up by your bootstraps” business; sometimes it takes someone to feed you a hot meal to help put things back together. And what a meal it was. We have this image of soup kitchens as places of horrible food, but, at least in this case, it was different. The chef takes a ton of pride in feeding people. He prepared a hearty dish of tortellini, ground beef, carrots, and potatoes. The dish was topped with cheese. It was wonderful. Served alongside green beans, salad, and fresh fruit. Nobody left hungry. It was the best meal I’ve had so far. I’m really glad the Jubilee Kitchen is doing what it’s doing. Without a doubt, I’ll be back to help serve lunch. You should help, too. Later that night, perhaps the UniverseKarmaSpiritbearWhatever needed to reinforce the notion that my food woes were simply self-constructed food woes: I Dropped The Beans. Words of advice: cooking beans late at night after a long day isn’t a brilliant idea. I didn’t have much of a choice, since my meal plan for the next day called for beans. 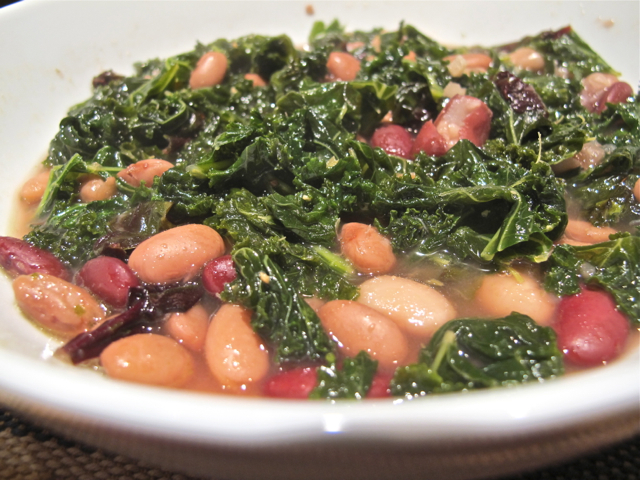 So–beans I cooked. And oh, they were glorious beans. 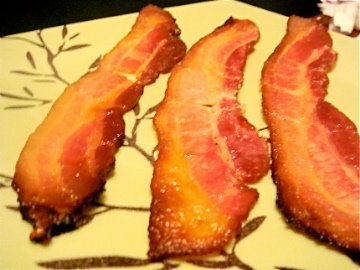 Flavored with leftover ham and smoke, texture perfect. After I dropped them I even considered picking them up from my kitchen floor. Nobody would know, right? OK. I did pick them up from my kitchen floor. They have since been sent to the compost bin, but I really was on the verge of eating them. Even though I’m aware this project is a self-constructed situation that has a firm end date, losing the beans because of a moment of clumsiness was a remarkably sad experience. I was on the phone at the time, and was totally unable to finish the conversation; all I could think about was how I lost three meal’s worth of food. I hope I’m never in a position where I have to eat beans that I scraped up from my kitchen floor. On Day Five I volunteered at the Environmental Charter School. My friend runs the lunch program there, and she’s always in need of assistance. So off I went. We picked up a hot meal of mac ‘n cheese (with and without shrimp) from the cafe at Phipps Conservatory, because the school itself doesn’t have a kitchen. There are a few things to unpack from the last sentence. First: mac ‘n cheese with SHRIMP?! What a strange combination. Many of the kids thought so, too. More importantly: NO KITCHEN!? 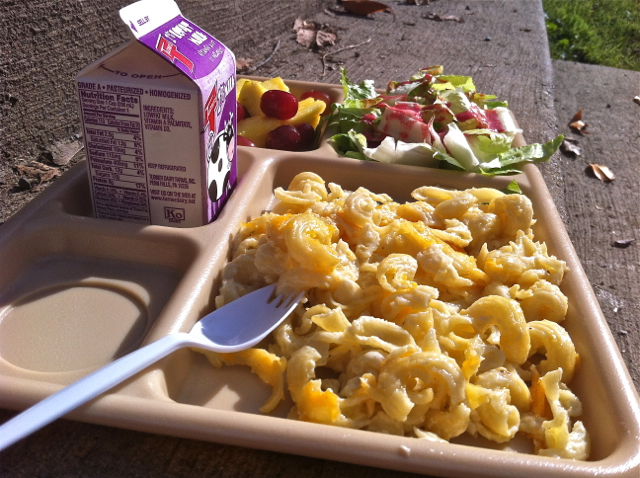 Fun fact: Many schools in the United States no longer have their own kitchens–they rely on pre-packaged meals. ECH is an example of making the best out of a bad situation; the school works with local restaurants to serve nutritious meals made from quality ingredients. Most other schools in this situation aren’t so lucky. It’s a sad sad sad thing (that’s getting better, but there is still a long way to go). It’s possible I might be in danger of losing jobs before I even get them. 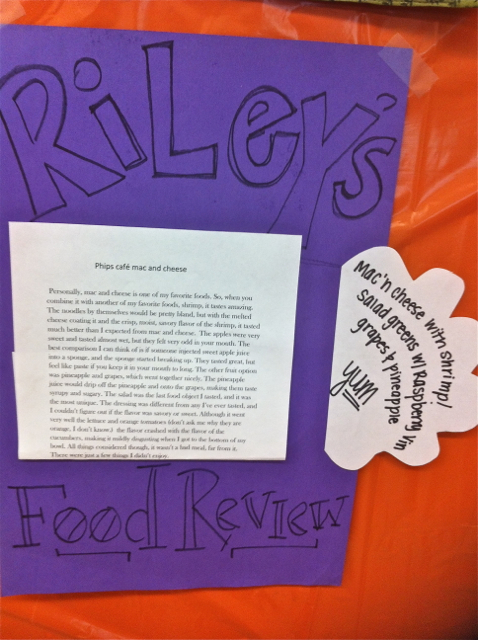 The Environmental Charter School has its own food critic, Riley. This kid is good! 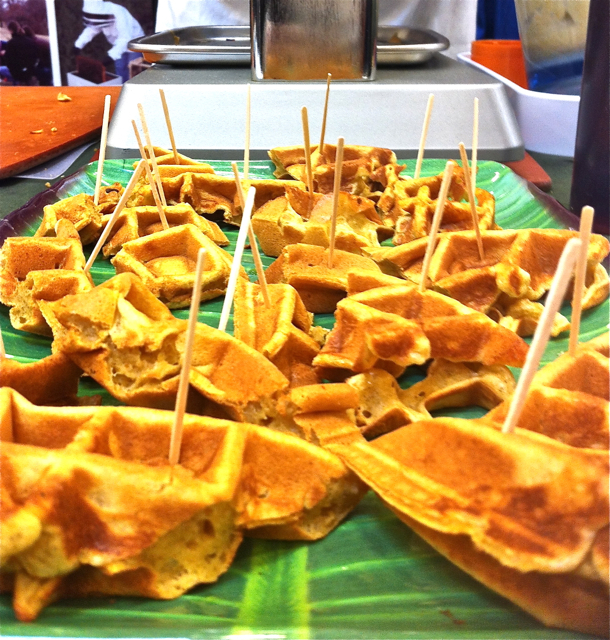 On Day Six, the plan was to do a chef’s demo at a local farmers’ market. It didn’t happen. A combination of crappy weather and the market losing half its space to preparations for “Light Up Night” caused the demo to be cancelled. Sad news, it would have been quite fun. But no big deal–I am on budget and ready to see this through. I’ve been cooking. Lots of cooking. I thought I spent a good amount of time in the kitchen to begin with, but nothing compared to the amount of time I’ve spent this week. Everything is cooked from scratch. The decision to eschew processed foods (well…alright, I did have a Top Ramen snack last night!) isn’t just a financial decision, it’s also an investment in time. 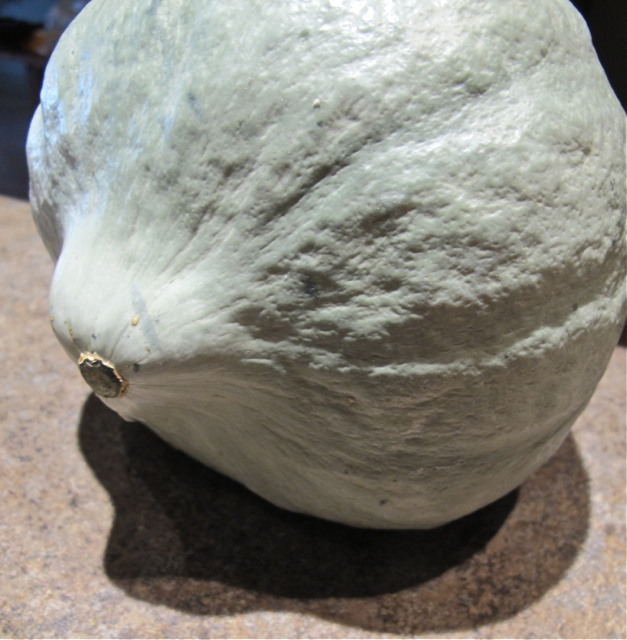 I made a wonderful puree of roasted Blue Hubbard squash (from our Eden Hall garden! ), carrots, and turnips. I used a little bit of butter (accounted for), the broth from boiling the carrots and turnips, and seasoned with salt and garam masala. It was wonderful! I bought a wee bit of ground beef (.27lbs for $1.35) and put half of it into a soup made with the last of my carrots, turnip greens (bonus! 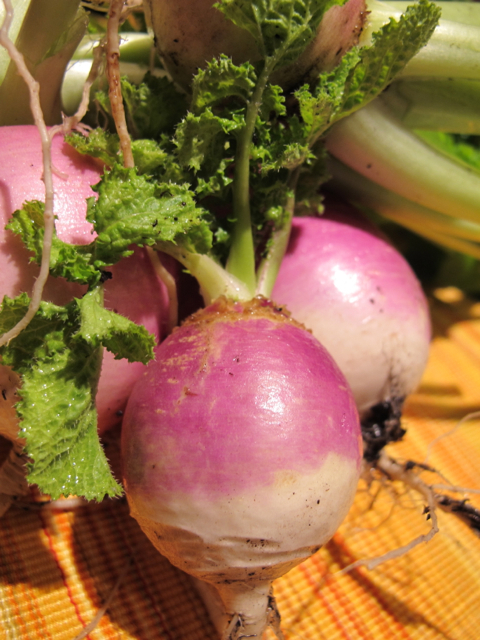 there were still turnip greens in my garden!!! ), onion, celery, tomato, and barley. It was remarkably satisfying. I also made a breakfast sandwich from two of my eggs and a tiny bit of my mozzarella. It felt nice to finally break into my cheese stash. And I made Baked Penne! Yes, that is a link to a video of me showing you how to make this dish. Watch the video, make the dish. Anyway, I’d been hoarding my mozzarella, and had enough money left to afford a tiny bit of Parmigiano Reggiano cheese. I used some of my frozen tomato sauce, the last of my home-grown garlic, and had an amazing dinner. I’m totally going to do this. And I’m eating pretty well, too. $1.35 for beef, $0.30 for Top Ramen, $1.50 for Parmigiano Reggiano cheese, $0.35 for pasta. Food, Community, and $35 For The Week: Day Three. Ham Rescue. On Day Three I ate ham. My task for the day was to use my cooking skills to teach someone how to make a dish they had always wanted to learn how to cook. In exchange, they would provide the ingredients. Part of my skill-set is helping new cooks learn how to make cooking enjoyable, so I thought this would be a perfect way to earn some food. 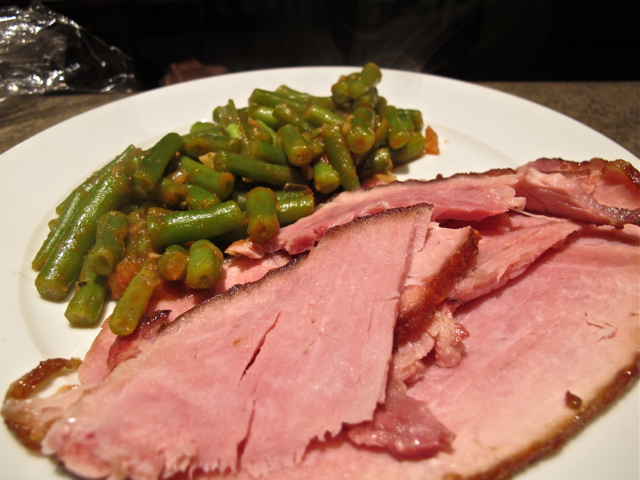 My ladyfriend is southern, but she didn’t know how to make one of the most iconic southern dishes: baked ham. Also, I’m pretty sure she was taking pity on me for my restricted diet. Regardless, I thought it was a good deal. Baking ham can be a totally simple proposition: purchase ham (already cured, smoked, and cooked), gently heat it in the oven, and then serve. Ham can also be a very complex proposition: purchase a fresh ham and do all the curing, smoking, and cooking yourself. As much as I’d love to cure and smoke my own ham, that was impractical for this task. OK, it’s generally impractical (though fantastic! 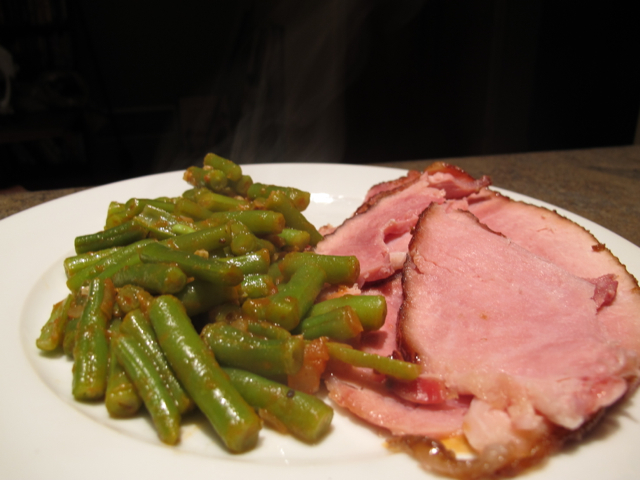 ), so it made much more sense to use a pre-cured ham. Since it wasn’t possible to teach her how to cure a ham from scratch, my best bet was show her how to enhance the flavor of a pre-cured one. 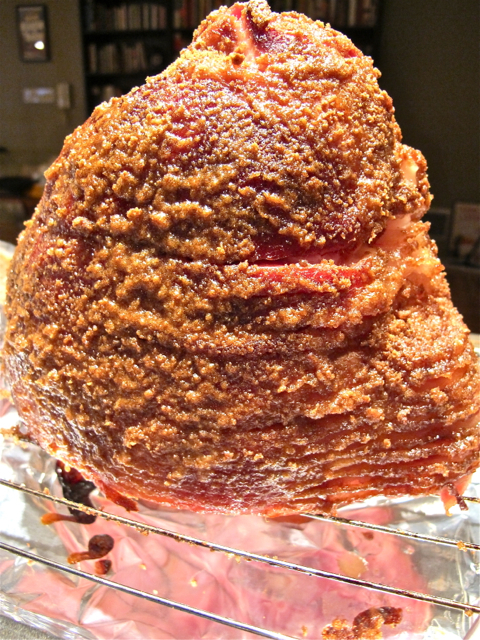 Hello Whiskey-and-Spice Ham! 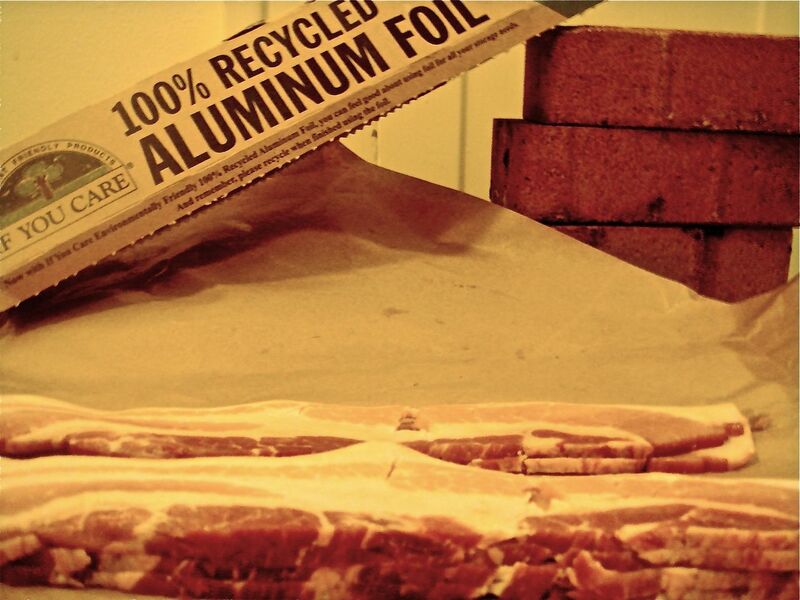 Start with a pre-cooked, bone-in ham. Pat ham dry with paper towels. Brush ham with a layer of Dijon Mustard. Pat on a layer of Brown Sugar over the mustard. 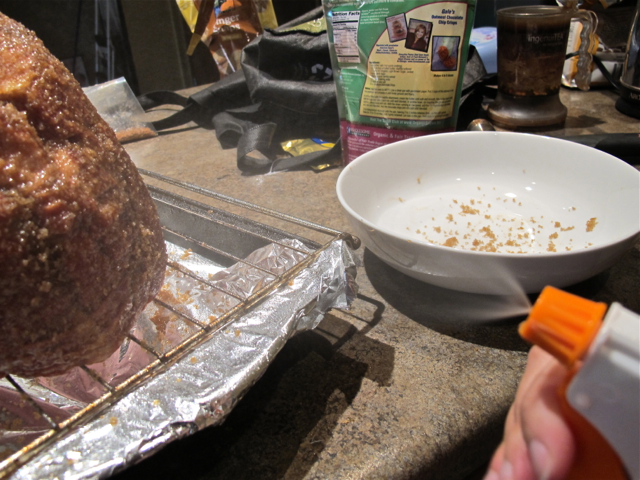 Spray ham with Whiskey (bourbon is best). Pat on a layer of Crushed Ginger Snaps. Tent with foil and bake at 275 for 15 minutes per pound. Raise heat to 325 and bake uncovered for last 15-20 minutes of cooking. I’ve taken some slack for this one because in the middle of this project I got to eat one of my favorite foods, which happens to be a giant and fairly expensive hunk of meat. So I’ll say this: I didn’t eat an entire ham, nor do I have plans to eat the rest of it (this week). I had a meal-sized portion, and reserved an extra slice for a breakfast sandwich the next day. The rest of the ham, except for the bone, will be frozen for later enjoyment (the bone will be used to flavor another round of beans). Also, although ham would certainly be high on my list of requested dishes, it wasn’t my idea (though it was very much appreciated). *If you’re wondering about my other meals: Oatmeal w/ maple apple butter for breakfast, leftover veggie soup for lunch, green beans with dinner, tiny bit of cheese and some pretzels (given to me on Sat.) as a snack, and an apple as another snack. Last week, The Huffington Post reported that nine Democrats in Congress decided to challenge themselves to live on $4.50 per day (the rate food stamps would be reduced to under a Republican proposal). They did this for a week. However, their diets were comprised almost entirely of processed foods. Challenge! A few friends and I are taking up the mantle to see if we can do this without cheap, processed foods. Or at least not any more processed foods than we normally would eat. (True Confession: I am, on occasion, partial to a bowl of Top Ramen.) 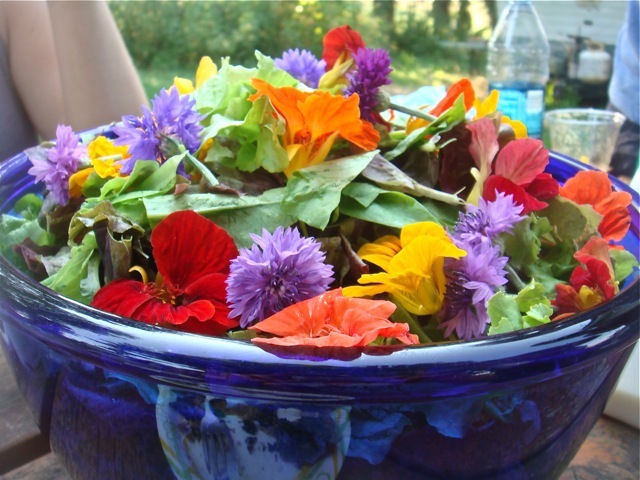 We are giving ourselves a weekly budget of $35, but also the freedom to trade our time/skills for food: if we garden, anything still left from that garden (in the dirt, jar, or freezer) is good; if we can cook a meal for someone who supplies the ingredients, that’s good too. The theory: if you are connected to the food community, you can still eat Good Food on a tight budget. We are not trying to play-act like we are food stamp recipients. All of us are creative professionals, and we all have greater access to the food community than most people do (at least at the moment). There are plenty of valid critiques of this project; many emails were exchanged regarding these critiques, and we came to the conclusion that perfection isn’t the goal. Having said that, I will try to address some of these issues at the end of the week. For now, I just want to see if I can do this. I’m up for the challenge. This is going to be tough. I can quite easily spend $35 a day on food. I like meat, but I try my best to only eat meat that’s been humanely raised. That kind of meat isn’t cheap. (And it shouldn’t be.) So I’m going to be mostly vegetarian this week. That’s a good challenge in itself, and I like it. Can I make $35 last for a week? We’ll see. At least I have a plan. Each day for the week, I’ll engage in a food-related activity that will hopefully result in a free (and delicious) meal. But before I do that, I need provisions. Coupons are allowed, so I’m cashing in a Living Social deal. I have $20 to spend at Whole Foods for the cost of $10. Budget is now $45. Most excellent. I also purchase 1 Bunch Celery ($2.00) and .67Lb. Kale ($0.60) from Giant Eagle. I already have 6 eggs in the fridge ($2.50) and 5 apples from the farmers’ market ($3.50). One of those apples was given to me for free. In the freezer I have an andouille sausage (given to me over the summer), pesto (garden), frozen tomatoes and sauce (garden). In the pantry I have 2 squash (given to me by a friend who had too many squash), garlic (garden), and various oils, vinegars, and spices (let’s factor $3.50 for those). I have $12.88 left to spend this week. I can do this. Please check out Sentences and Food and Culinary Cory. They aren’t planning on posting until the end of the project. However, you should read their blogs anyway–they’re full of wonderful stories and recipes. A farm is alive. The land and the animals still need attention even if the people that are supposed to attend to it are missing. 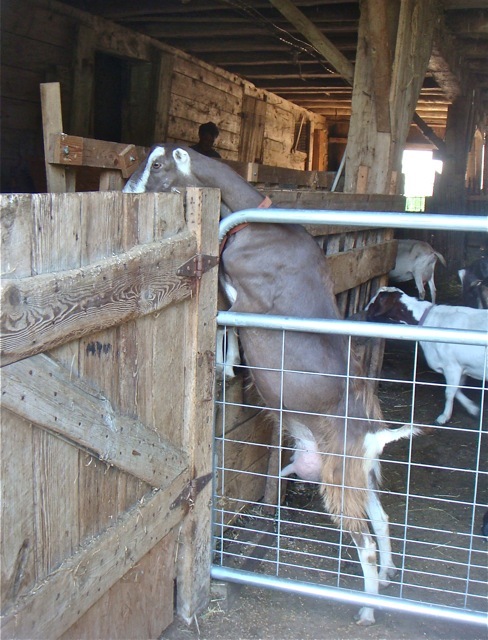 An entire growing season, a livelihood, can be ruined because of unexpected circumstances. But things can be saved when a community comes together to lend a hand. 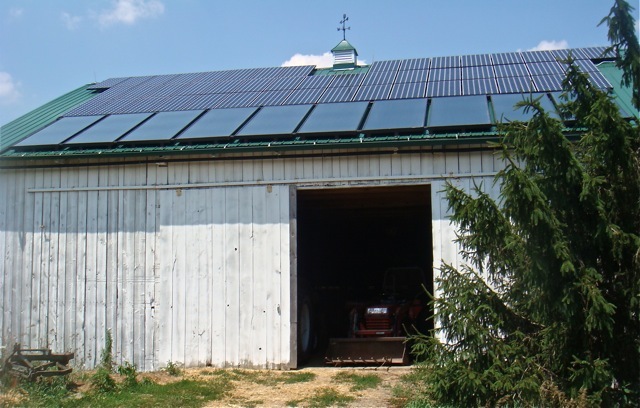 The farm is about two hours from Pittsburgh. It’s on a beautiful piece of land in a beautiful piece of the country. 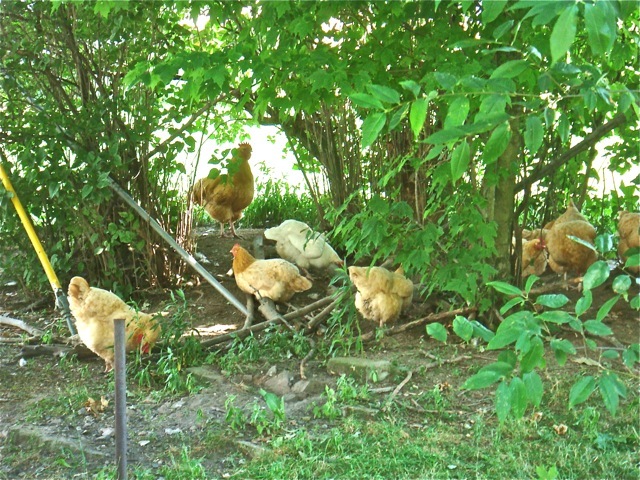 There are chickens and goats and dogs roaming land speckled with bundles of hay and rows of corn. It’s the very picture that the massive monoculture agrofarms want to you to think about when you think of farmland, except in this case it’s actually the real deal. But the farm was in danger of being overrun with weeds. One of the people who owns the farm is ill. Those that were left hadn’t the time or manpower to take care of everything. So a bunch of us took off from Pittsburgh, and drove through the rolling countryside, gloves and weeding tools in hand, ready to help. We spent several hours in the hot July sun pulling unwanted plants from the ground. I was in the cornfield, on hands and knees, clearing land so the late-planted rows of corn had a chance to grow. I’ll be honest with you: I’ve paid a lot of lip-service to the theory that you have to physically work the land in order to really understand why it’s important to pay higher prices to farmers that choose to grow their crops sustainably. It’s not that I didn’t actually think that true; I respect farmers, I believe they are entitled to be paid a fair price for their work…but, I never physically understood the toil of farm work until last weekend. A farm field is a hot hot place in the middle of July. Weeding is taxing on the body. So is harvesting crops in the heat of a summer day. Anyone who chooses to do this for a living deserves our respect. But this isn’t a story about me getting out of the kitchen/library and onto a cornfield. This is a story about people coming together to help other people in need. Phrases like “dust yourself off and get back on the horse,” or “pull yourself up by your bootstraps” are often given as advice when someone is down. And it’s true, you do need to get up and get back in the game. But sometimes you have to put the word out, ask for help, and hopefully some friends & strangers will pitch in. It’s a wonderful thing. At the end of the day, the farm’s fields were a bit better off than they were before we arrived. There is still work to be done (the work never ends during growing season), and if they asked, I’m sure we’d all be happy to make the drive again. 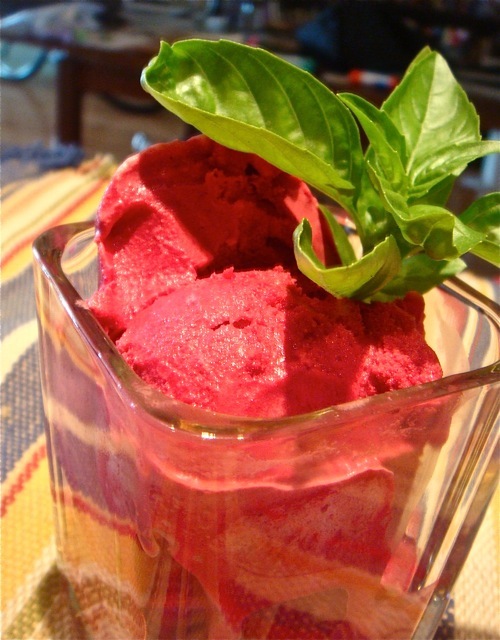 Making ice cream from beets sounds like an absurd idea. 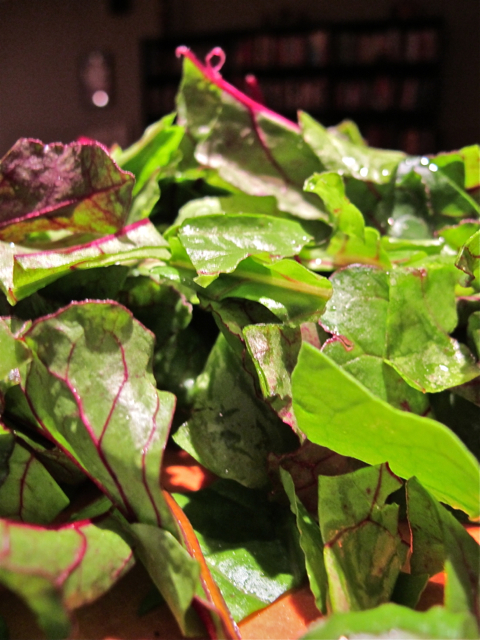 Beets are a hard, earthy root vegetable. Ice cream is soft and sweet. Why would I think about combining these things? Well, I’m not quite sure what I was thinking when I decided to make this. OK. True confession: it was the Ambien*. What can I say…I had an early morning the next day. A hilarious pre-sleep conversation led to a fantastic idea. Beet ice cream is as addicting to eat as it is beautiful to look at. Honestly. Add juice to a small saucepan over medium heat. 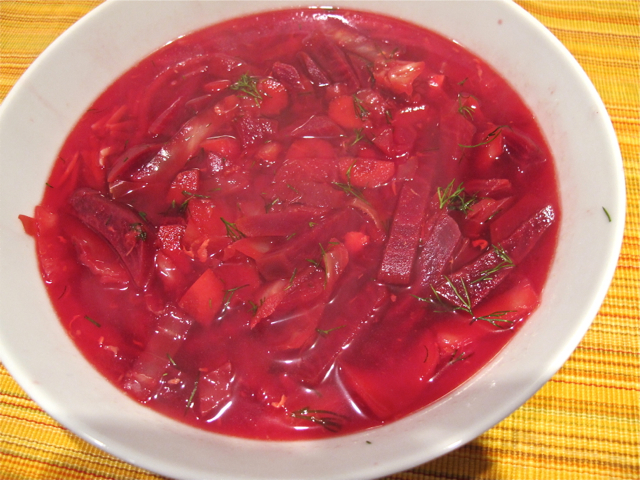 Reduce the sugared beet juice by half. It should be syrup-like when finished. It will also have a terrific flavor. 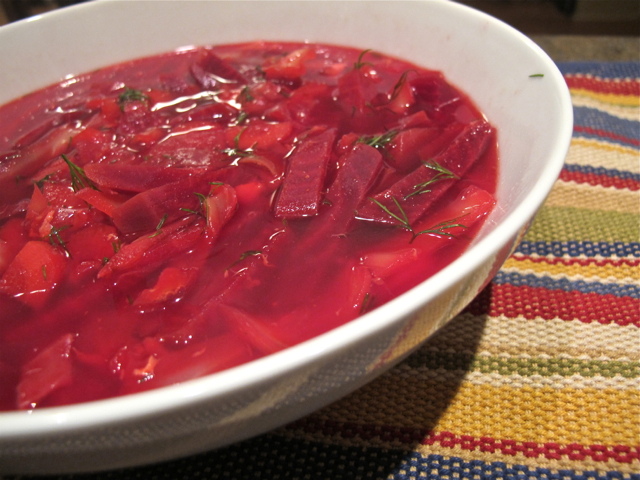 Resist temptation to eat beet juice syrup. Add reduced beet syrup to the cream mixture. Add to ice cream maker. *I suppose I should include a VeryClearAndObvious Legal Statement so you don’t sue my pants off: The purpose of this blog post is not to encourage the use of Ambien to help you make more creative ice cream flavor choices. OK. Good. **Tempering is technique that is used to combine temperature-sensitive foods, in this case eggs. If you were to add the egg yolks directly to the hot mixture, the yolks would curdle and scramble. That would make for some pretty awful ice cream! So what you do is add a little bit of the hot liquid to the eggs, mix it in, and add a little bit more, mix, repeat a few more times. This will slowly bring the egg yolks to a temperature where they can be mixed into the rest of the liquid without scrambling. Hey hey, it’s an all new episode of This Man’s Kitchen. You too can make baked ziti- it’s super tasty! For more This Man’s Kitchen videos, check out the collection on Vimeo.